Auto-Populated - New Items, Hot Sellers, and Recently Viewed Items are auto-populated. This means the products displayed by this widget type can not be chosen by users; they are chosen by the system based on different criteria and product meta data. For example, Hot Sellers displays the products with the highest sales rank. Manually Populated -- Featured Items, Spotlight Items, and Product List widgets are manually populated. The products displayed in these widgets are chosen by you or other site users. All product display widgets can be renamed and edited. For example, it is possible top create a product list widget and name it "Hot Sellers". 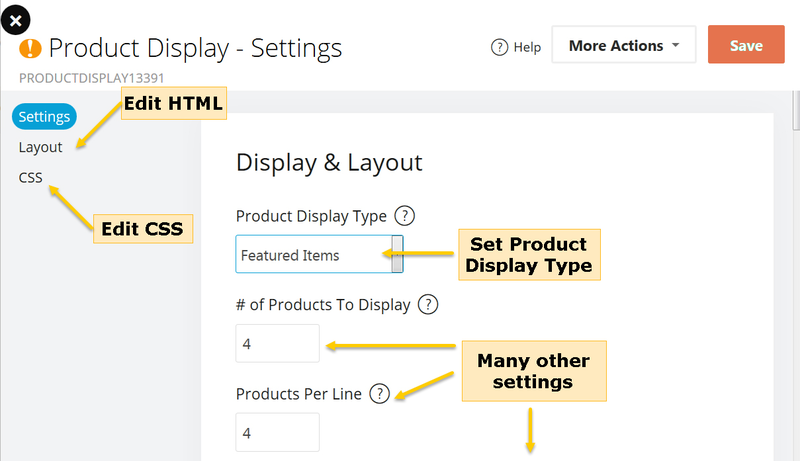 This article explains how to create, edit, and add products to these product display widgets. Also Purchased Items - Displays products frequently purchased with items in customer's cart. Hot Sellers - Displays the items with the highest sales rank. Related Items from Cart - Displays the related items of the products currently in the customer's cart. Customer Favorites - Displays a list of the customer's must frequently purchased items. If customer is not logged in, the list will be blank. Viewed this but bought these - Displays products purchased by customers after looking at different product. You will not be able choose which items get displayed in these widgets. If you would like to choose which products get displayed in the widget, change the product display type in the widget's settings to one of the manually populated widgets listed in the next section of this article. The name of the widget can be changed by adding the desired name to the header field. Attribute Product List - Lists products that contain the selected attributes. Items displayed alphabetically or by sort order. Category Product List - Lists products from a selected category. Items displayed alphabetically or by sort order. Customer Product List - If customer is logged in, displays the product list set in Edit Customer > Marketing. Does not display otherwise. eProducts - Displays items that are marked as eProducts set in Edit Product > eProduct. Featured Items - Displays items with Featured checked in Edit Product > General, under Product Flags. Items displayed alphabetically or by sort order. Manufacturer Product List - Lists products from a selected manufacturer. Items displayed alphabetically or by sort order. Product List - Displays product from selected product list. Items displayed alphabetically or by sort order. Related Items - Works only on product details page. Displays the product's related items set in Edit Product > Related Items. Spotlight Items - Displays items with Spotlight checked in Edit Product > General, under Product Flags. Items displayed alphabetically or by sort order. Subscription Items - Displays items that are marked as subscription products set in Edit Product > General. This article says that we can name the widget anything that we want, for example instead of Spotlight - "On Sale" but it doesn't really specify where or how to do this. When you check for example "Spotlight" it also puts a banner on top of the image, once the text in the label is changed does the text on the image change? If you could add a link showing more information about where to modify the widget label it will be great. The article is referring to the widget's `Header Text` setting. You can use that setting to rename a `Featured Items` widget to `New Items` for example. That doesn't really tell you how to set it up though for new store owners. I have been trying to find a way to change the custom tabs to something I want them to say - is this the only approach you can take? And I'm seriously confused about widgets because I can add them to the pages - to the products - to the website and though they are there they rarely show up for editing or as a visual for anyone to see or well I should say I never see them active? I just completely rewrote this article. Let me know if you still have questions!